Sorry, we are currently sold out of 'Panama Don Julian Pacamara Natural'. Please check back later. This new crop Panama happens to be one of our all time favorites. We were lucky enough to visit this farm where this incredible coffee is grown, and on arrival it became clear that the extraordinary taste of the coffee is the direct result of the exraordinary characteristics of the farm. At first perusal you might assume that you were walking through a nature preserve, where coffee trees are surrounded by other plants and enormous shade trees tower above. It is no accident that the farm feels this way; the owner, Mrs. Burneskis, thinks the farm should be left in as natural a state as possible. She has a level of respect and connectivity for the coffee plants that really comes to light when you walk through the sprawling greenery. Finca Don Julian is located about 1600 meters above sea level, and grows their coffee in rich, black volcanic soil. The growing area being in a protected tropical rainforest gives the coffee a unique flavor, great acidity and bold body. 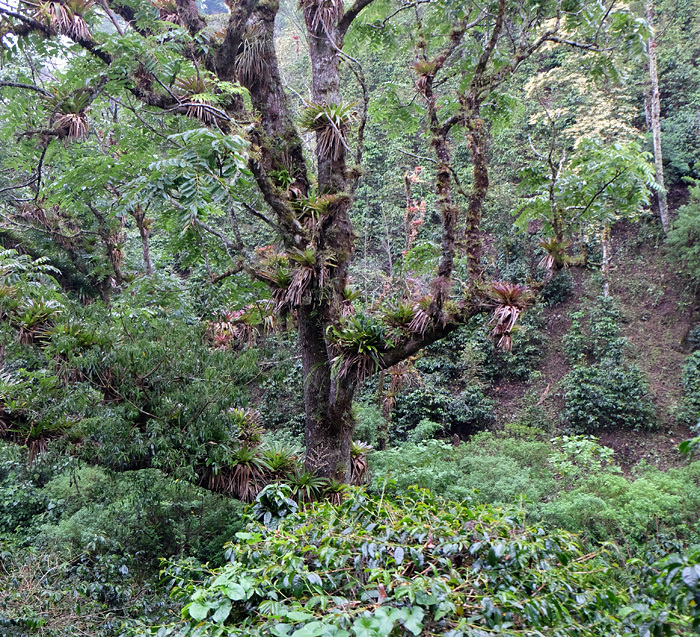 Can you find the coffee trees in this preserve? Pacamara is a hybrid of two coffee varietals: Pacas, which is a Bourbon mutation, and Maragogipe, which is a Typica mutation. It was developed in El Salvador in the mid-twentieth century. The mixture at its best produces very deep, brothy flavors that always seem reminiscent of dark fruit like plums, raisins and prunes. It is a natural processed coffee, a brief explaination of which is required to understand the terminology. Since the advent of micro milling machines, most notably that developed by Penagos in Colombia, small farms have the ability to process their own coffee for a somewhat modest cost of entry. These machines use pressurized water mist to strip away the outer skin of the coffee cherry, and can remove pulp (the fruit surrounding the coffee husk) to a fine tolerance, leaving selective amounts of pulp to dry on the husk. When all the pulp is removed it is fully washed. When a tiny amount remains, it is called yellow honey; when a little more remains it is considered red honey, and a lot remaining is black honey. Neither the skin nor the pulp being removed results in a natural processed coffee (like this one). Cup Characteristics: A very fruity aroma, notably cherry and strawberry. Flavors of black cherry, vanilla extract, clover honey and cherry wood. Complex with a long finish. Roasting Notes: We like this coffee best when roasted 30 seconds to a minute past the end of 1st Crack. Pacamara coffees are pretty resilient beans, but keep in mind natural processed coffees tend to roast faster than washed coffees.